Celiac disease-related osteopathy among Saudi celiac patients: Are we adherent to recommendations? Background/Aims: There are no reports from Saudi Arabia documenting the picture of osteopathy in celiac disease (CD) and the adherence of physicians to the guidelines and recommendations to screen for bone disease. We conducted this study to document the prevalence of CD-related osteopathy and the Saudi physicians' adherence to the screening recommendations. Patients and Methods: We identified the biopsy proven CD cases diagnosed between 2003 and 2012. In addition to demographic data, we collected laboratory (serum calcium, phosphate, alkaline phosphatase, 25-dihydroxy vitamin D, and parathyroid hormone levels) and imaging [Dual-energy X-ray absorptiometry (DEXA)] data. Vitamin D levels of <50 nmol/L and 50−<75 nmol/L defined deficiency and insufficiency, respectively. T score (of lumbar spine and femoral neck) of ≤−2.5 defined osteoporosis and a score of ≤−1 and >−2.5 defined osteopenia. Results: We identified 80 children and 128 adults with CD. Only 42% of children and 67% of adults had their serum vitamin D level measured. DEXA was ordered in 7% of children and 36% of adults. Vitamin D deficiency was widely prevalent and significantly higher in adults (95.3%) than children (76.3%). Low bone mass density (BMD) in adults was 86.9% (45.6% with osteopenia and 41.3% with osteoporosis). Conclusions: We document low adherence of physicians to recommended guidelines to recommendations to screen for osteopathy in CD. Vitamin D deficiency and low BMD are highly prevalent among Saudi CD patients. This may be a reflection of the low vitamin D stores in the Saudi general population. There has been a rise in the reported prevalence of the disease over the last two decades. Western studies reported a prevalence of 0.2:100 rising to 1:100 in more recent studies.,,,, The higher prevalence could have resulted from the wider use of highly sensitive and specific serological markers for diagnosis or a true rise in the incidence of the disease.,,,, Serological surveys in three regions of Saudi Arabia reported a prevalence of 2.2% of CD in the general adolescent population. A recent mass screening study revealed a prevalence rate of biopsy proven CD of 1.5% among school-aged children (6–15 years) in Riyadh city, the capital of Saudi Arabia. Metabolic osteopathy (MO) is a common manifestation of CD with prevalence of low bone mass density (BMD) (osteopenia or osteoporosis) varying between 9 and 72%., The wide range reflects the fact that various studies recruited different populations with variable degrees of gluten abstinence. Secondary hyperparathyroidism and osteomalacia due to vitamin D and calcium malabsorption are the main culprits for low BMD in CD. The rise of proinflammatory cytokines also plays a role. The difference in biochemical markers of MO between children and adults with CD. This is a retrospective study conducted at King Khalid University Hospital, Riyadh. Cases of CD were identified through the histopathology registry of celiac disease. The data were collected from 2003 to 2012. The criteria for the diagnosis of CD were positive IgA-Endomyseal antibody (IgA-EMA) and/or positive tissue transglutaminase antibody titer (IgA-tTG) and intestinal changes on duodenal biopsies consistent with CD, according to Marsh–Oberhuber classification.,, Before 2006, we used IgA-EMA test to screen for CD. The IgA-EMA was performed at our hospital by indirect immunofluorescence method using endomyseal lining of smooth muscle bundles (IMMCO Diagnostic, The Hague, Netherlands); a titer of ≥1:20 was considered positive. The IgA-tTG was performed using enzyme-linked immunosorbent assay (ELISA) (Inova Diagnostics, San Diego, USA); a value of >20.0 U/ml was considered positive. As IgA-tTG was available in our hospital only after 2006, both serological tests were performed together after that date. The files of all patients were reviewed jointly by the author and a research assistant. In addition to personal data, CD presentation, and complications, the following results were recorded – serum calcium, phosphate, alkaline phosphatase, 25-dihydroxy vitamin D, and parathyroid hormone levels. Vitamin D levels of <50 nmol/L and 50−<75 nmol/L were diagnosed as deficiency and insufficiency, respectively, in accordance with the US Endocrine Society guideline., Also recorded were the results of DEXA and technetium bone scan, when performed. The DEXA was performed by using a scanning arm which emits two X-ray beams aimed at the soft tissues and the bones. The density of the bones is obtained by subtracting that of the soft tissues. Bone scans were performed by injecting technetium-99 m intravenously following by scanning with a gamma camera, which acquires single photon emission computed tomography. Osteomalacia and rickets manifest as areas of high technetium uptake caused by increased osteoblasts activity. The technique is highly sensitive for the detection of osteomalacia even when the biochemical tests are equivocal., All the above data were recorded before gluten abstinence. The machine used for DEXA was Lunar Prodigy in the early tests followed by Lunar iDXA (General Electric, Madison, Wisconsin, USA). The machine used for bone scans was JETStream Workspace R1.O in the early tests followed by JETStream Brightview XCT SPECT (Philips, Eindhoven, Netherlands). We identified 90 children and 128 adults with CD [Table 1]. Vitamin D deficiency was widely prevalent and significantly higher (P = 0.005) in adults (95.3%) than in children (76.3%). Only 2.6% of the children and none of the adults had a normal serum vitamin D level. The mean (±SD) serum level of Vitamin D was 38.69 (±19) nmol/L in children and 22.45 (±15.2) nmol/L in adults, respectively (P< 0.001). The percentage of adults with low BMD was 86.9% (45.6% with osteopenia and 41.3% with osteoporosis). The mean T score for adults was −2.37. The T score is not used among children. Apart from vitamin D deficiency, there was no significant difference in biochemical indices between children and adults. The physicians' adherence to the screening recommendations was low. 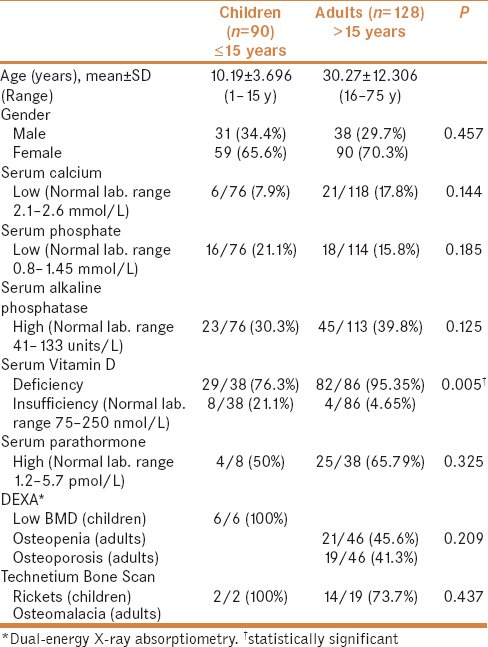 Only 38/90 (42%) children and 86/128 (67%) adults had a serum vitamin D level estimation. DEXA was ordered in 6/90 (7%) children and 46/128 (36%) adults for screening purposes. None of the patients had any history of bone disease. The main findings of the study are that the physicians' adherence to the guidelines recommendations was poor with regards to performing serum vitamin D level (42% in children and 67% in adults) and DEXA (7% in children and 67% in adults). The biochemical markers were not significantly different except for Vitamin D deficiency, which was higher in adults (95.3%) than that in children (76.3%). Both age groups had high rates of reduced BMD. The presence of low BMD (osteopenia or osteoporosis) among CD patients varied widely between 9–72% in all series and 38–72% before gluten restriction., This puts Saudi Arabia with 86.9% (45.6% osteopenia and 41.3% osteoporosis) at the high end of the scale. The wide variation between countries may reflect differences in ethnicity, economic status, and sun exposure. Low BMD is more common in adults and may be present even in asymptomatic patients at the time of diagnosis., Therefore, it is surprising that the screening in our hospital for BMD and vitamin D deficiency is so low despite the increasing awareness of bone disease and clear recommendations in the guidelines., However, this lack of adherence to guidelines has been documented in other university hospitals. In 2016, Singh and Garber reported from Harvard Medical School, USA, that among 222 adults with CD, only 80 (36%) underwent DEXA, and of these 80 patients, only 43 had DEXA screening specifically in relation to their celiac diagnosis. The DEXA screening was only 15.8% in children. A therapeutic intervention was made in the majority of these patients as a result of DEXA. There is no conclusive explanation for the low adherence in teaching hospitals in USA and Saudi Arabia. However, we speculate that the prevailing impression that CD is a “gastrointestinal disease” rather than a bone disease may have contributed to this nonadherence to guidelines. We recommend universal testing of biochemical markings of osteopathy as well as DEXA in Saudi CD patients given the high prevalence of bone disease. The study has several limitations. The retrospective nature has resulted in some information gaps such as supplements received. Similarly, we cannot comment on any confounding factors that could have contributed to low T score such as hormonal therapy or low body mass index. Finally, we have no data on what action was taken for these patients and the response to treatment. We report low adherence of physicians to the guidelines' recommendations to screen with serum vitamin D level and DEXA. The rates of vitamin D deficiency and reduced BMD approach 100% and are higher than reported worldwide. This may be a reflection of the low vitamin D levels in the general population in Saudi Arabia. Applying these points to clinical practice may improve the care of CD patients in Saudi Arabia. The author would like to thank Dr Fatima Angkaya for her invaluable help in collecting the data, Mr Ameer Marzouk for the statistical analysis, and Ms Cora Rivera for the secretarial assistance. Marsh MN. Gluten, major histocompatibility complex, and the small intestine. A molecular and immunobiologic approach to the spectrum of gluten sensitivity ('celiac sprue'). Gastroenterology 1992;102:330-54. Ludvigsson JF, Bai JC, Biagi F, Card TR, Ciacci C, Ciclitira PJ, et al. Diagnosis and management of adult coeliac disease: Guidelines from the British Society of Gastroenterology. Gut 2014;63:1210-28. Tommasini A, Not T, Kiren V, Baldas V, Santon D, Trevisiol C, et al. Mass screening for coeliac disease using antihuman transglutaminase antibody assay. Arch Dis Child 2004;89:512-5. Ivarsson A, Persson LA, Juto P, Peltonen M, Suhr O, Hernell O. High prevalence of undiagnosed coeliac disease in adults: A Swedish population-based study. J Intern Med 1999;245:63-8. Collin P, Reunala T, Rasmussen M, Kyrönpalo S, Pehkonen E, Laippala P, et al. High incidence and prevalence of adult coeliac disease. Augmented diagnostic approach. Scand J Gastroenterol 1997;32:1129-33. Carlsson AK, Axelsson IE, Borulf SK, Bredberg AC, Ivarsson SA. Serological screening for celiac disease in healthy 2.5-year-old children in Sweden. Pediatrics 2001;107:42-5. Aljebreen AM, Almadi MA, Alhammad A, Al Faleh FZ. Seroprevalence of celiac disease among healthy adolescents in Saudi Arabia. World J Gastroenterol 2013;19:2374-8. Larussa T, Suraci E, Nazionale I, Abenavoli L, Imeneo M, Luzza F. Bone mineralization in celiac disease. Gastroenterol Res Pract 2012;2012:198025. Bernstein CN, Leslie WD, Leboff MS. AGA technical review on osteoporosis in gastrointestinal diseases. Gastroenterology 2003;124:795-841. Fouda MA, Khan AA, Sultan MS, Rios LP, McAssey K, Armstrong D. Evaluation and management of skeletal health in celiac disease: Position statement. Can J Gastroenterol 2012;26:819-29. Scott EM, Gaywood I, Scott BB. Guidelines for osteoporosis in coeliac disease and inflammatory bowel disease. British Society of Gastroenterology. Gut 2000;46:i1-8. Rubio-Tapia A, Hill ID, Kelly CP, Calderwood AH, Murray JA, American College of Gastroenterology. ACG clinical guidelines: Diagnosis and management of celiac disease. Am J Gastroenterol 2013;108:656-7. Hjelle AM, Apalset E, Mielnik P, Bollerslev J, Lundin KE, Tell GS. Celiac disease and risk of fracture in adults-a review. Osteoporos Int 2014;25:1667-76. Marsh MN. The immunopathology of the small intestinal reaction in gluten-sensitivity. Immunol Invest 1989;18:509-31. Oberhuber G. Histopathology of celiac disease. Biomed Pharmacother 2000;54:368-72. Dickson BC, Streutker CJ, Chetty R. Coeliac disease: An update for pathologists. J Clin Pathol 2006;59:1008-16. El-Desouki MI, Othman SM, Fouda MA. Bone mineral density and bone scintigraphy in adult Saudi female patients with osteomalacia. Saudi Med J 2004;25:355-8. Wilkins WE, Chalmers A, Sanerkin NG, Rowe MJ. Osteomalacia in the elderly: The value of radio-isotope bone scanning in patients with equivocal biochemistry. Age Ageing 1983;12:195-200. Organization WH. Assessment of fracture risk and its application to screening for postmenopausal osteoporosis: Report of a WHO study group [meeting held in Rome from 22 to 25 June 1992] 1994. Available from: http://apps.who.int/iris/handle/10665/39142?mode=full. [Last Accessed on 2017 Jan 11]. The international society for Clinical Densitometry. Official Positions, Middletown, CT, USA; 2015. p. 1-21. Borges JL, Brandão CM. Low bone mass in children and adolescents. Arq Bras Endocrinol Metabol 2006;50:775-82. Singh P, Garber JJ. Implementation and adherence to osteoporosis screening guidelines among coeliac disease patients. Dig Liver Dis 2016;48:1451-6. Villanueva J, Maranda L, Nwosu BU. Is vitamin D deficiency a feature of pediatric celiac disease? J Pediatr Endocrinol Metab 2012;25:607-10. Imam MH, Ghazzawi Y, Murray JA, Absah I. Is it necessary to assess for fat-soluble vitamin deficiencies in pediatric patients with newly diagnosed celiac disease? J Pediatr Gastroenterol Nutr 2014;59:225-8. Tavakkoli A, DiGiacomo D, Green PH, Lebwohl B. Vitamin D status and concomitant autoimmunity in celiac disease. J Clin Gastroenterol 2013;47:515-9. Alfawaz H, Tamim H, Alharbi S, Aljaser S, Tamimi W. Vitamin D status among patients visiting a tertiary care center in Riyadh, Saudi Arabia: A retrospective review of 3475 cases. BMC Public Health 2014;14:159. Hussain AN, Alkhenizan AH, El Shaker M, Raef H, Gabr A. Increasing trends and significance of hypovitaminosis D: A population-based study in the Kingdom of Saudi Arabia. Arch Osteoporos 2014;9:190. Al-Saleh Y, Al-Daghri NM, Khan N, Alfawaz H, Al-Othman AM, Alokail MS, et al. Vitamin D status in Saudi school children based on knowledge. BMC Pediatr 2015;15:53. Lerner A, Shapira Y, Agmon-Levin N, Pacht A, Ben-Ami Shor D, López HM, et al. The clinical significance of 25OH-Vitamin D status in celiac disease. Clin Rev Allergy Immunol 2012;42:322-30. Schøsler L, Christensen LA, Hvas CL. Symptoms and findings in adult onset celiac disease in a historical Danish patient cohort. Scand J Gastroenterol 2016;51:288-94. Ouda S, Saadah O, El Meligy O, Alaki S. Genetic and dental study of patients with celiac disease. J Clin Pediatr Dent 2010;35:217-23. World Gastroenterology Organisation Global Guidelines/Celiac Disease 2016. Available from URL: http://www.worldgastroenterology.org/UserFiles/file/guidelines/celiac-disease-english-2016. [Last Accessed on 2016 Dec 18]. Liu W, Yang LH, Kong XC, An LK, Wang R. Meta-analysis of osteoporosis: Fracture risks, medication and treatment. Minerva Med 2015;106:203-14.